Sometimes, just sometimes, I eat tacos for breakfast (and it took every ounce of willpower not to put a poached egg on top). Preheat oven to 375˚. Thinly slice onions and cut butternut squash into 1/4″-1/2″ cubes. Toss with olive oil and cumin. Roast until tender, 20-30 minutes; depending on size of cubed butternut squash. 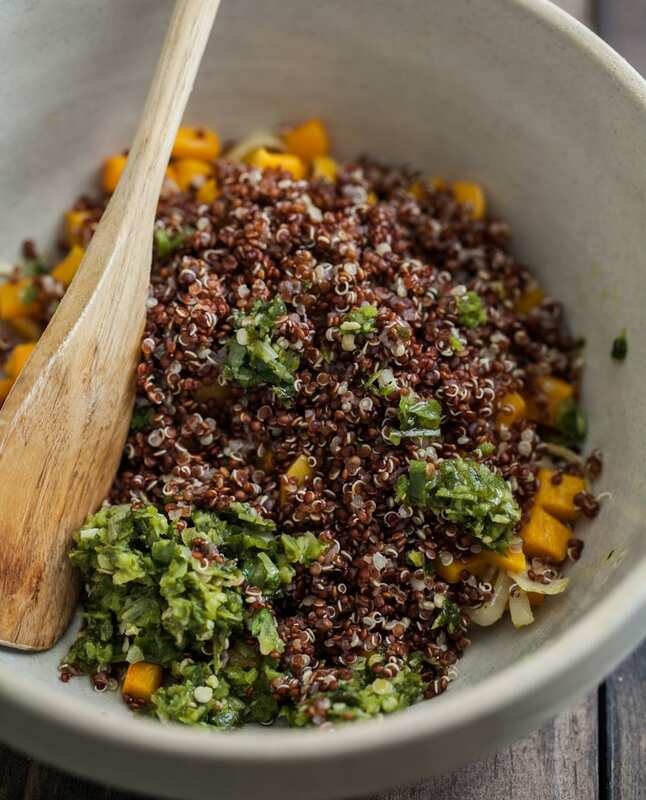 While butternut squash cooks, whip up quinoa and Chimichurri (I had both in the refrigerator). 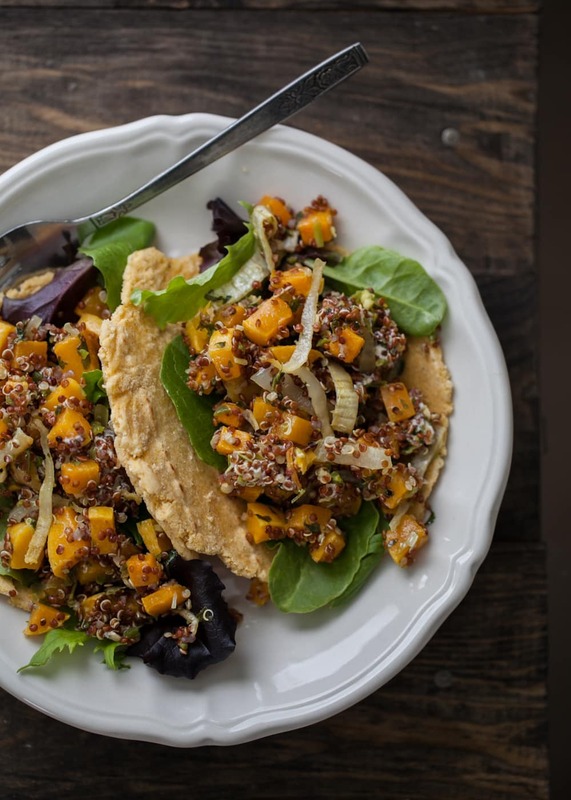 Once butternut squash is done, toss together with quinoa, chimichurri, and goat cheese. Heat tortillas and layer in lettuce and butternut squash. Top with extra cilantro, a squeeze of lime juice, or greek yogurt if desired. *Adjust based on your spiciness choice. Remove seeds and reduce to 1 jalapeño if wanting less spice. YUM!! I love everything about these! Everything! Yum! These look amazing! I love tacos and could eat them for every meal of the day. Love the colors! So stoked that you posted this! It’s perfect transitional weather kind of food. We still have butternuts around, but I always want to eat foods with more of a warm weather vibe this time of year. This meets me right in the middle. I want jalapeño chimichurri way too bad. Beautiful, Erin! My Quinoa is white. Why is yours brown? I’d love to try your lovely recipe! Hi Daniela- Quinoa actually has many varieties with the three most popular being white, red, and black. I use whatever I pick up at the store, so you could definitely use white here! Nothing wrong with tacos for breakfast! This dish looks fab. 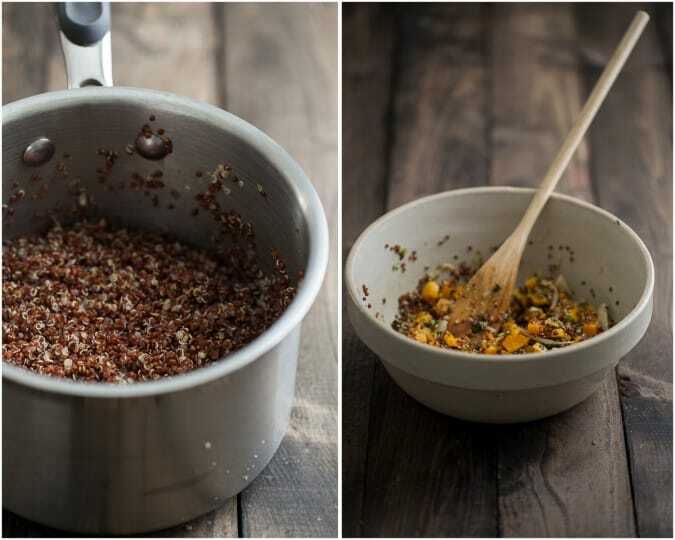 Do you always use red quinoa? In the UK it’s easier to find white quinoa in the shops – I’ve read that red is higher in calories but lower in fat but doesn’t seem like there’s much of a difference nutritionally or taste-wise? Honestly, from what I’ve read (and tasted) there isn’t much of a difference. I tend to trend towards red and black just because it gives dishes a little extra pop of color. I’ve also been known when I’m running low, I’ll mix a couple of the colors together! fair, tacos are always all the rage to me – I love em! LOVE em! These look SO GOOD. Glad you mentioned the sweet potato swap because we always have those on hand. I’m all over the tacos for breakfast. Or lunch or dinner for that matter. These are gorgeous, Erin! I want my life to involve tacos for breakfast more often. I’d really like to make these, however I think the recipe is incomplete, I’ve done a lot of cooking, but it seems the how to mix the Chimichurri Sauce is missing. 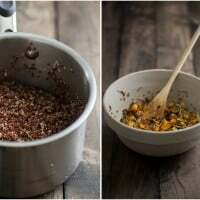 The Ingredients are there, am I to assume to use a food processor on the ingredients? Also what is the asterisk next to the Jalapenos for? I would assume yet again it is to change quantity depending on how spicy one wants them. Do I remove the seeds, and innards of the peppers or use them too? Is there a link to make the sauce somewhere else? I really don’t like making guesses in the kitchen, with me that;s when things go wrong. I really can’t wait to try this, it does look and sound wonderfully tasty. Thanks for the help and for sharing this.